Lock in a great price for Mara's Place – rated 8.3 by recent guests! The location is great, next to The Split. The people were nice. Location is great but still quite at night. The hotel is closed to the best spot on the island- 'The Split'. Room was clean with warm shower and a good a/c, which is very important. Overall we were happy with our stay. 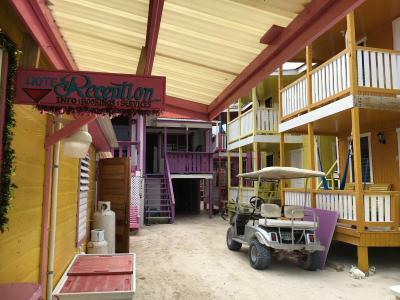 Excelent location close to the pier, bars and restaurants. The beds were AWESOME! 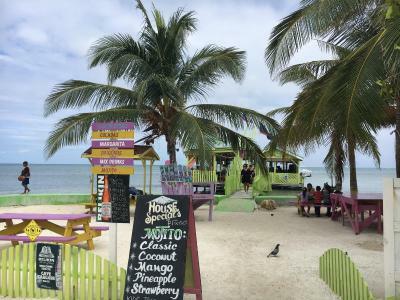 Right next to the best beach in Caye Caulker. Upgrades in the room were great. AC very cold. Great modern bathroom. I was contacted a few weeks prior to my arrival to let me know they would be having some construction work being done during my stay. They offered me a free cancellation prior to arrival or at any time during my stay. I thought it was a good sign that they are concerned about their guest’s happiness even before arrival. I kept my reservation and was glad I did. 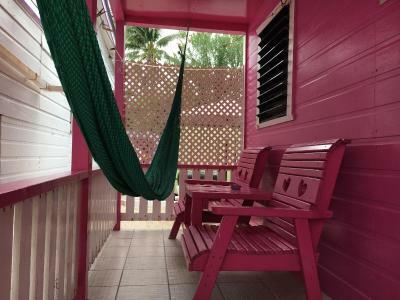 I had an oceanfront bungalow with a private balcony and hammock. 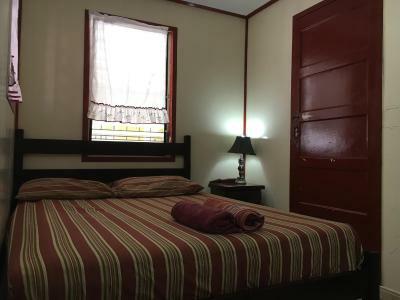 The room was recently renovated, spacious, clean and had all the basic amenities needed. 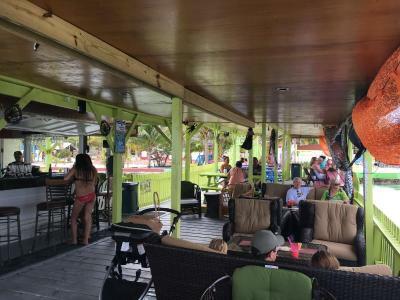 The location is just across from a nice bar where they have water hammocks, swings and inner tubes to float with your bucket of beer or mixed drinks. It is also next to the “split” where there is a large beach, bonfire, volleyball and “the place” to go to watch the sunset. They have a DJ every day so the music can get loud if that bothers you. The streets were usually quite by 10-11 pm. The view from our room was excellent. We were near the famous "split." We always felt safe while at the property. 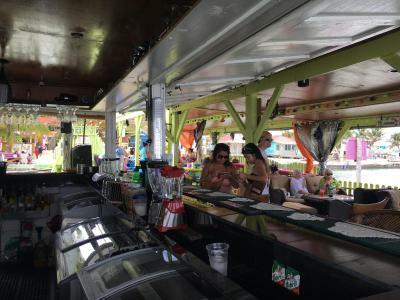 The Sip and Dip bar is 10 metres away from the property which was great too! This place was clean and had very helpful staff. There were no critters to bug us inside (or outside like most of Caye Caulker). I appreciated that they had air conditioning, although it was occasionally loud when it kicked it. There's a handy button to turn off the bright display at night. I found the double bed and pillows to be relatively comfy for 2 people to sleep. The water was hot enough in our unit for a warm/hot shower in the clean bathroom. The location is near two dive company headquarters. Good Wi-Fi. I fell in love with the front porch hammock. My husband didn't feel comfortable using it as a bigger man, but I adored it! 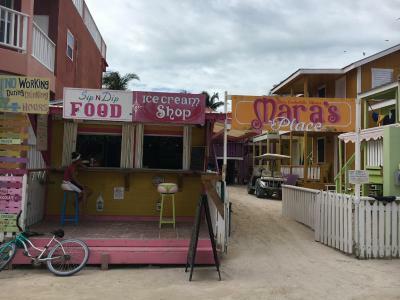 Mara's Place is offering accommodations in Caye Caulker. Featuring a shared kitchen, this property also welcomes guests with a restaurant and a terrace. The rooms are equipped with a balcony with a sea view. The rooms in the guesthouse are equipped with a TV with cable channels. At Mara's Place, the rooms come with a seating area. When would you like to stay at Mara's Place? House Rules Mara's Place takes special requests – add in the next step! Mara&#39;s Place accepts these cards and reserves the right to temporarily hold an amount prior to arrival. Mara's Place accepts these cards and reserves the right to temporarily hold an amount prior to arrival. I really wanted to like this place, but unfortunately, I cannot recommend it. 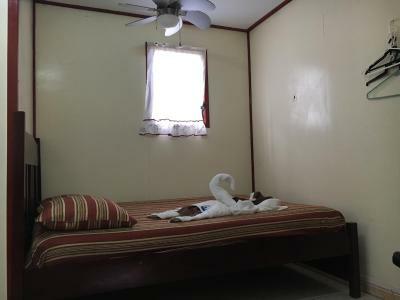 Because the walls are made out of wood and the climate is tropical, the suite smelled super musty. I'm surprised I didn't see this in any of the reviews I read before booking. We needed to air the place out daily by opening the windows before we could stay in there for any length of time. We did not bring this to the manager's attention. Maybe she would have recommended a different solution. Whether the windows were open or not, the place was very loud. The walls were thin enough that you could hear people yelling and partying, which happens especially during weekends at The Split and the Sip'N Dip nearby. One Saturday, it was loud until 1-2am, but other nights things would calm right down around 7pm (sometimes it was completely dead by 7pm! See picture). The room was rather small. In our suite (orange, which is 1/ 6 or 8 suites) the nightstand drawers had to be closed so someone could get in and out of the bathroom. There was no safe vault, not that anything went missing, but it would have helped us feel more secure with our money. Like other places on the island, you will not be able to flush toilet paper down the toilet. It took some adjusting is all. The Sip N' Dip across the street looked like it used to be a fun place. "Dip" areas were not available as all the submerged furniture was broken. I would highly recommend staying at the Iguana Reef Inn if you can. 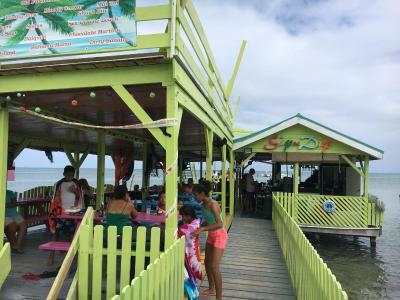 We stayed at their beach bar during most days of our trip. Alternatively, stay somewhere one or two nights and transfer somewhere else once you get a better feel of the island. A/C was too loud to run at night. Great location by the Split. Nice hammocks on decks. Very large rooms. Disappointed in the staffing. There was someone there who showed us our room, not super friendly. We stayed for four nights. On night three they cleaned our room, took away a set of towels and never replaced them. There was nobody at the desk at all on our last full day, nobody to ask about check out procedures, where we should leave our key.... Never got the towels back, other guests had to ask for toilet paper and someone at the bar across the street helped them out. This may have been the result of a staffing mixup but nobody told us a thing. 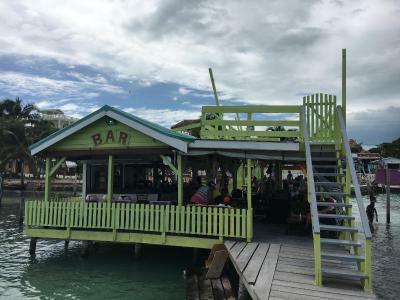 We stayed in a number of ‘bargain’ places in Belize and the service/staffing at Mara’s Place was lacking in comparison. We found the beds extremely hard. It was soft to touch/push on but then we found it to be very hard to sleep on which indicates the mattress was worn out. Having a fridge in the room would have been really great but unfortunately it wasn’t provided. No coffee on premises either. Our room was a bit dark and small. You need to keep drapes closed, otherwise no privacy (if your room is on the ground floor). 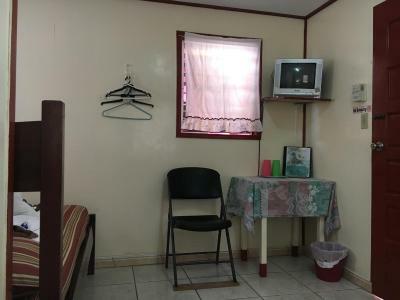 Clean and comfortable rooms on an excellent location. Warm showers, airconditioning, comfortable beds. 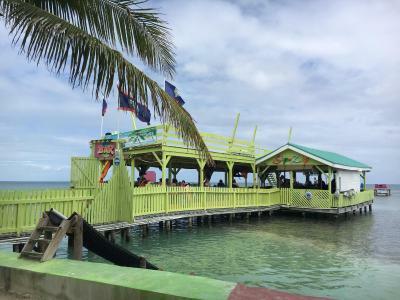 We both enjoyed our stay here and would stay here again if we visit Caye Caulker again. Nothing not to like unless you need a TV. We didn't need one. Great location at the SPLIT, where most of the action is. Friendly staff and reasonable prices for food and drink at Sip&Dip accross the street. Convenient location for most anything you want to do. Would stay again. The only thing I didn't like was the pillows, I think ours were only pillowcases stuffed with sheets, not a big deal though. I love to spend time on the deck and it was very small. Hardly room for the hammock. No fridge in the room. TV never did work. No cable channels, just Netflix and You Tube.